Britain’s representatives in Egypt were re-styled high commissioners in 1914. The second of them (and Kitchener’s successor), Henry McMahon, reported to Sir Edward Grey, Foreign Secretary, in February 1915 that his house was now so full of offices and staff (including the Egyptian Foreign Ministry and the Arab Bureau) that it was becoming impossible to use it as a private house. He had a solution in mind that would both extend the residence site and enable some of the offices to be moved out of the house. Immediately to the south of his residence lay the Garden City, an area laid out in 1905 as a grand new township for Cairo. 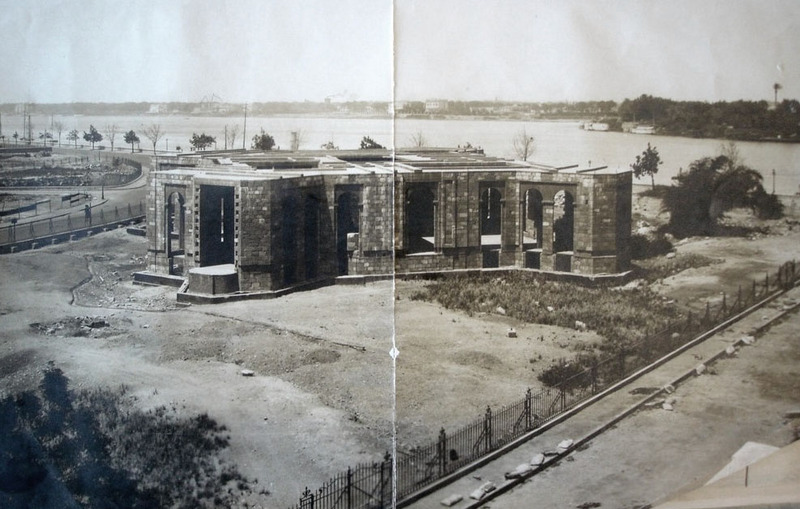 In the north-west corner of the Garden City, adjacent to the Nile and the residence, was a plot of about one hectare for sale on which stood a substantial but unfinished stone building that had reached the first floor before abandonment in 1908. The plot was owned by Charles Bacos, one of the several Syro-Levantine investors who had created the Garden City, and the building had been begun by the Romanians. McMahon thought the whole property could probably be bought for £35,000 and that the building on it could be completed for overflow offices from his house, and perhaps attached to it by a passage. Additionally, the roads that lay along two sides of the plot belonged to the Egyptian government and McMahon thought they could be ceded free of charge. The Treasury was eventually persuaded, and agreed to the purchase of the Bacos plot in September 1915. Despite its purchase, the building lay vacant throughout the rest of the War. 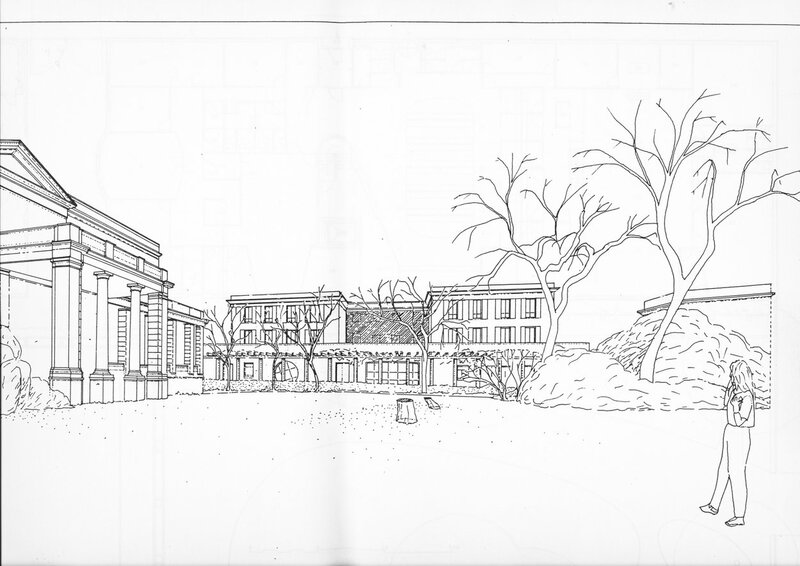 After it, instead of looking to the awkward Bacos building to cope with a staff that had grown to 40 (from 7 pre-war), 13 of whom were occupying the ballroom, Allison designed a huge scheme in 1919 that extended the existing building southwards across the whole of the Bacos plot (requiring the demolition of the half-completed structure on it), such that it became two and a half times as long as the residence. Allison also brought a wing forward from the ballroom towards the Nile, and pushed one back, away from the Nile, at his new south end. 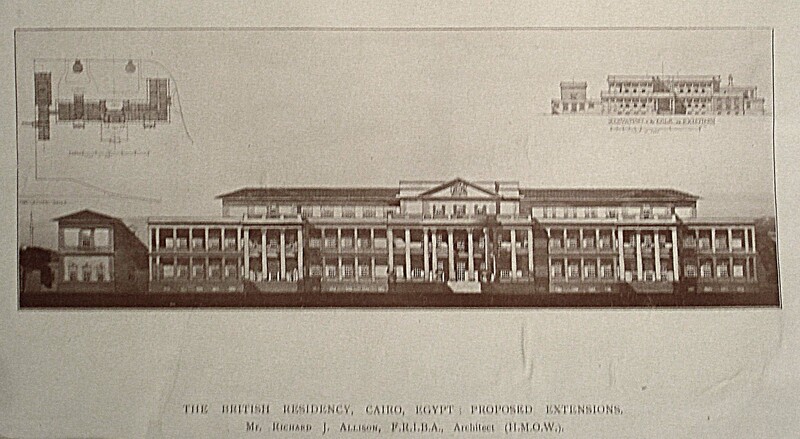 The whole was elevated and detailed in much the same manner as Boyce’s 1890 building, although Allison minuted on 4 July 1919 that ‘The long facade to the Nile should in my opinion be designed on more impressive lines than the existing somewhat commonplace and uninteresting structure’. Allinson’s drawing of the elevation to the Nile was exhibited at the Royal Academy in summer 1920 and was published in The Building News in February 1921. The proposal was actively supported by the Board of the Office of Works and by the high commissioner, by then Allenby. But the estimate of £135,000 was simply too much for the Treasury to contemplate in hard times, and Allison’s grandiose proposal was finally set aside in August 1922. But the requirement for more space had not gone away and attention at last turned to making best use of the uncompleted building on the Bacos site. It was a complicated structure and Oscar Faber, a structural engineering practice, was commissioned to advise the Office of Works. The Treasury agreed in principle in April 1924 to proceed with finishing it but higher tender returns than estimated delayed a start on site until the autumn. The building was completed in July 1925, at a cost of £11,575. The Stable Block was converted in 1927, and extended in 1938, for the military guard. The Post at Cairo became an embassy in 1936. In the 1950s, the Old Stable Block, as it came to be known, was used for workshops on the ground floor and the embassy club on the first. 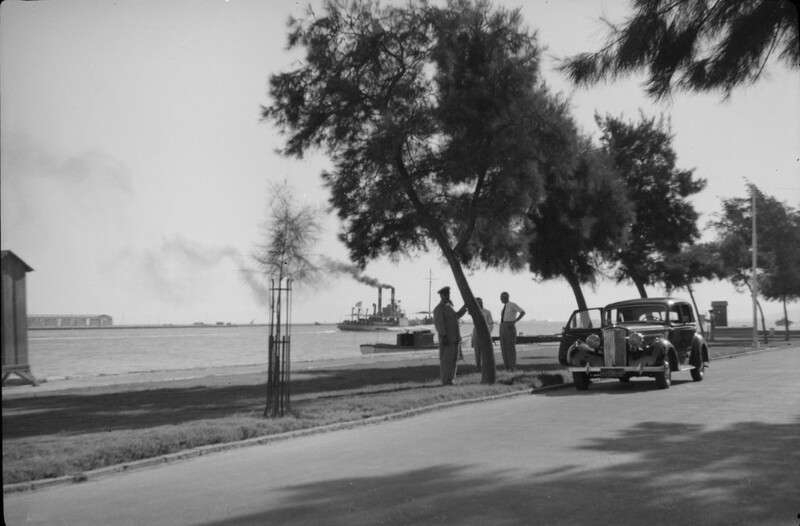 By the mid-1940s, the British embassy compound, because it lay along the bank of the Nile, was one of the last obstructions in central Cairo to a road running continuously along the east bank of the Nile. In July 1947, the Ministry of Works and the Foreign Office decided not to resist any Egyptian request to cede land for this purpose and to hope for compensation. Some believed that the residence would have to be moved if the road was to be built. The Egyptians announced in early August 1954 that they wanted access to the embassy land by 1 September 1954 so as to start building this final stretch of road, requiring the surrender of a 20-26 metre wide strip along the whole Nile frontage. Two senior members of the Ministry hastened to Cairo to negotiate as best they could: they saw no chance of being offered a good alternative site for a residence but they managed to reach agreement that compensation of LE300,000 would be paid, though not necessarily soon nor in one sum, and that the Egyptians would also pay for a new boundary wall. Both undertakings were honoured, and the compound area shrank to 2.2 hectares as a result of the road. The outturn cost was about £200,000. The Bacos building was then demolished and the consulate-general building on Rue Gameh Charkass was sold. A few months later, the Suez crisis erupted, diplomatic relations were broken, and Switzerland became the protecting power for the next three years. 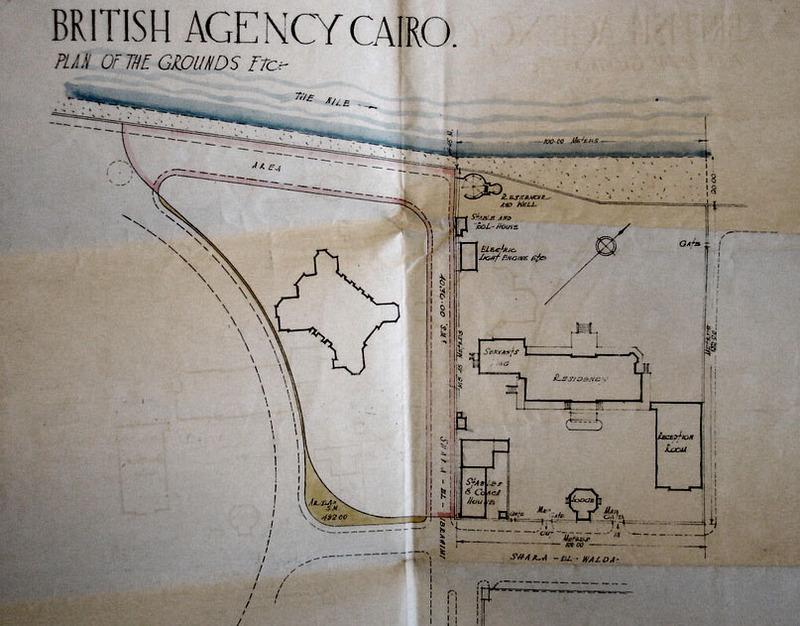 After a chargé returned to Cairo in December 1959, followed by an ambassador in March 1961, it rapidly became apparent that the new offices building was much too large for the number of staff, and several UK-staff flats were therefore inserted. The future of the residence had been reviewed during the diplomatic break because, no longer containing any offices, it was significantly larger than required for even a senior ambassador’s residence. But retention was confirmed at the first Foreign Office inspection after the break. 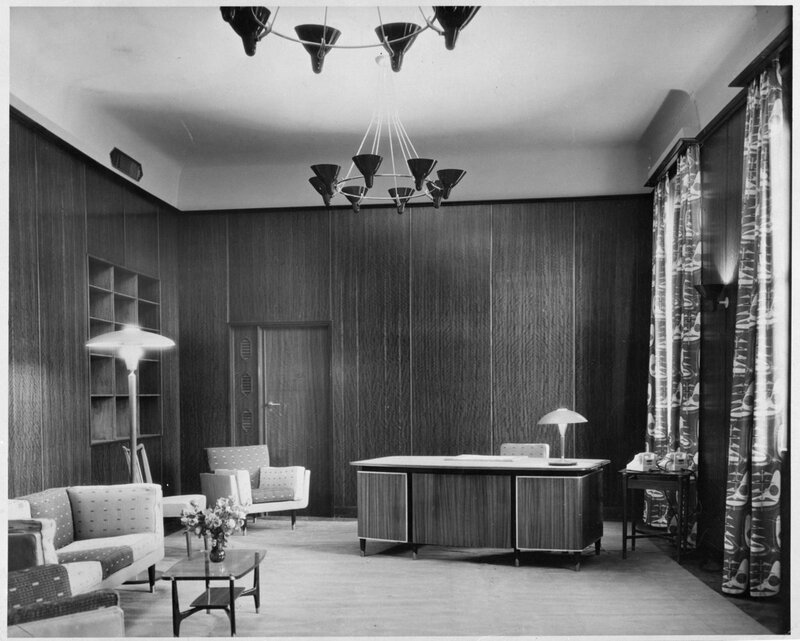 The ballroom was leased in 1963 to the British Council for its library, and later housed the immigration and visa sections of the embassy. 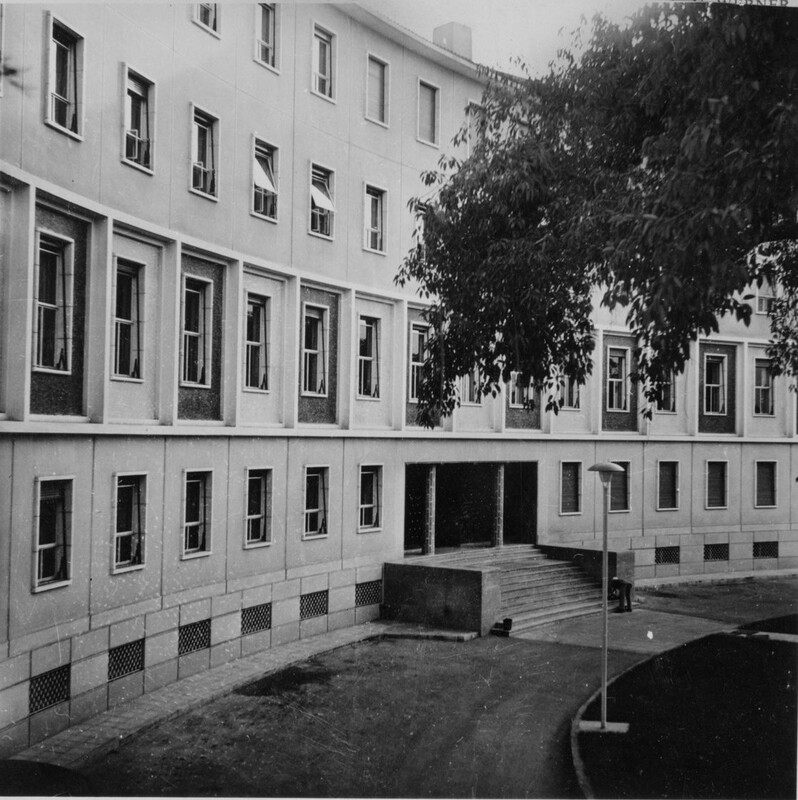 Radical proposals for the compound, including substantially reducing its size, rebuilding the residence, and building more staff accommodation, were put forward by the Ministry of Works in the later 1960s and by the PSA in the later 1970s. None (mercifully) came to anything. During the 1980s, the FCO (having won responsibility for the overseas diplomatic estate from the PSA in 1983) sought acceptable ways of making better use of the compound. In 1986, Seifert International, architects, was commissioned for a sketch scheme for a free-standing block of 11 UK-staff flats near the middle of the compound. The result was a scheme on five floors but the idea was suspended in the face of severe Post objections, including to the loss of the rose garden (formerly the site of the Bacos building). 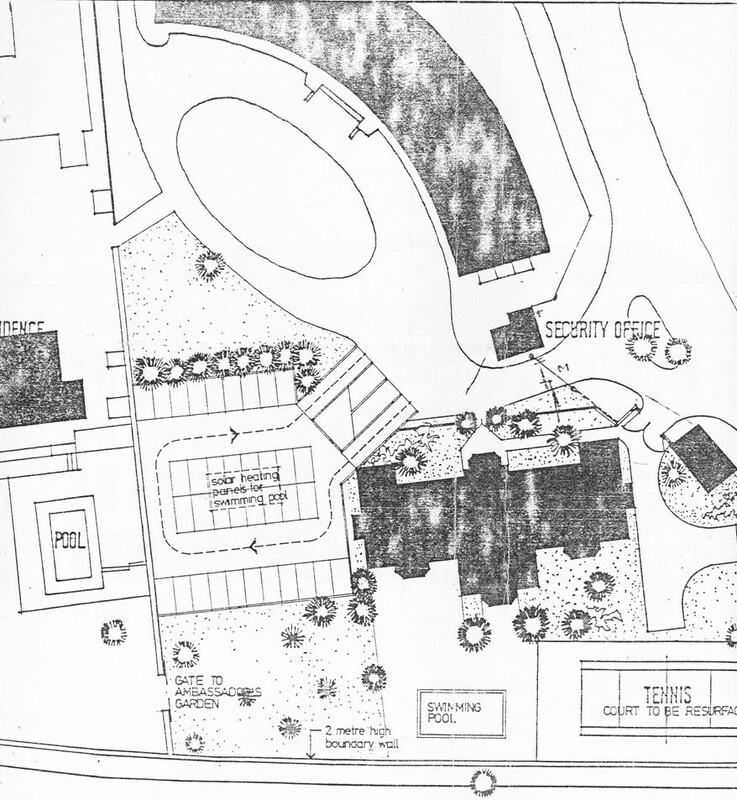 This failure was followed by the appointment in 1988 of Jeremy Dixon, architect, to suggest how a residential accommodation scheme might best replace the ballroom. There was no clear wish to demolish the ballroom but it was short of a relevant role and rather wasted a site that could perhaps be put to more productive use. Dixon produced a restrained and elegant design for a three storey building with visa and consular offices on the ground floor, and three flats on each of the upper floors. This scheme, and indeed the whole idea of putting offices and staff on this corner of the site, eventually failed for security reasons. 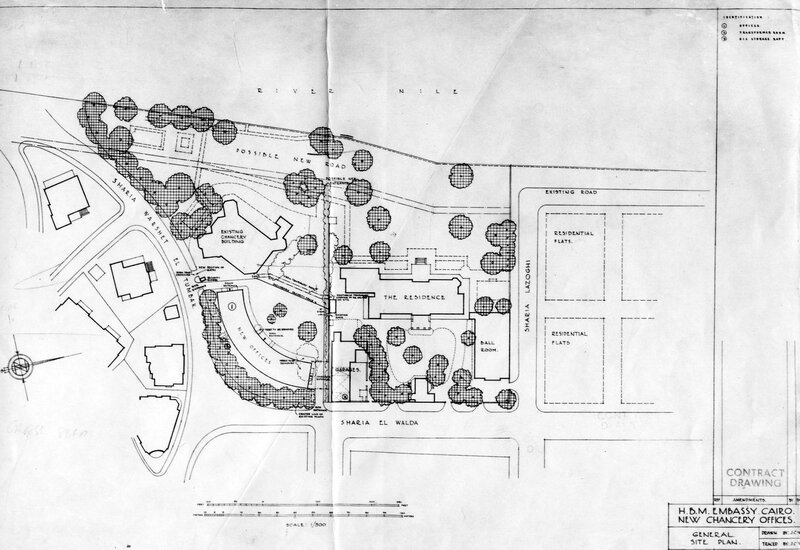 Siteplan of compound, 1924, showing Bacos land and building at left and south, and new road strips ceded. Unfinished building on Bacos site, 1924. 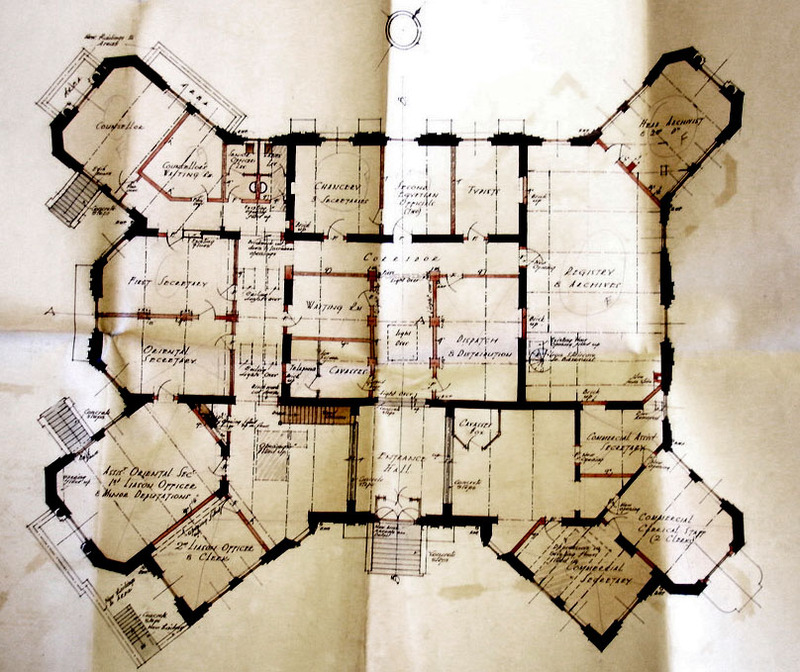 Proposed layout for offices in Bacos building, 1924. Proposed extension of residence southwards by Allison, 1921. New road along the east bank of the Nile, 1954. 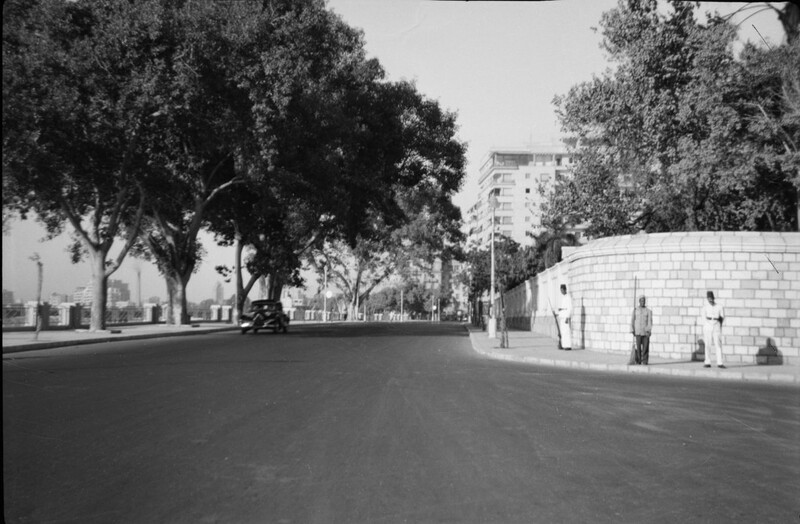 New boundary wall between residence garden and new road, 1954. 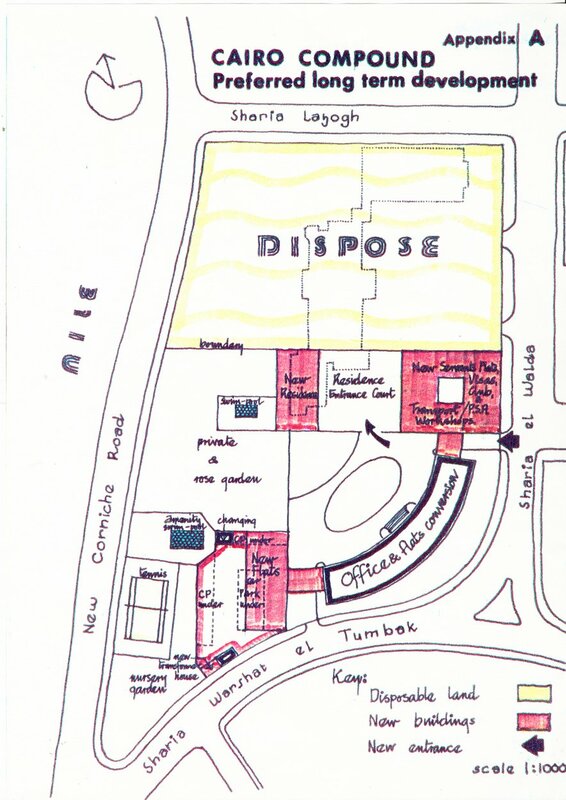 Siteplan for new offices, 1951. Centre of rear frontage of new offices, 1956, with coat of arms and flagpole above staircase screen. 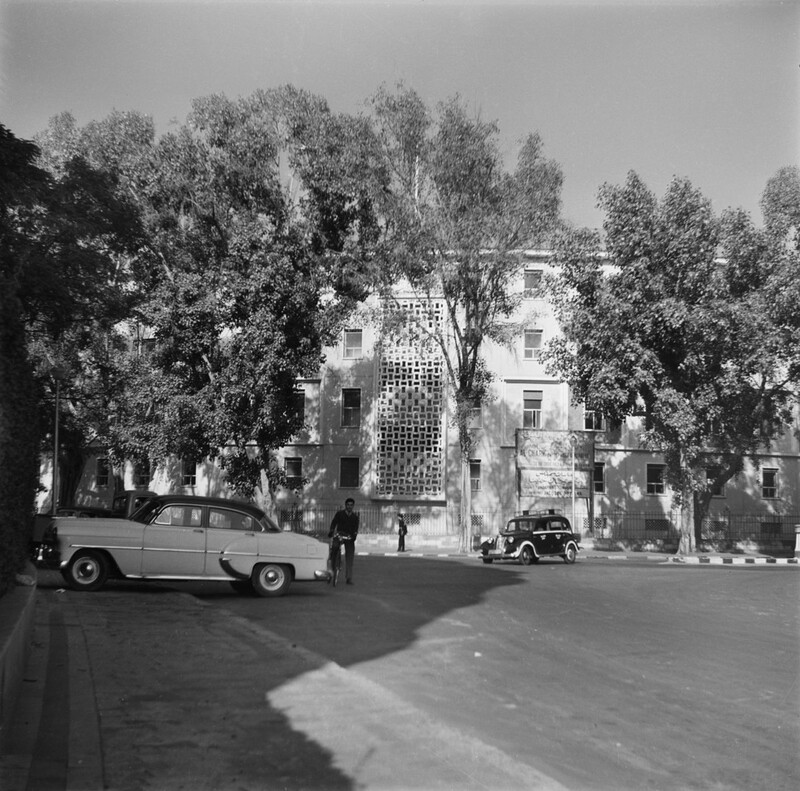 Frontage of new offices facing Nile, 1956. 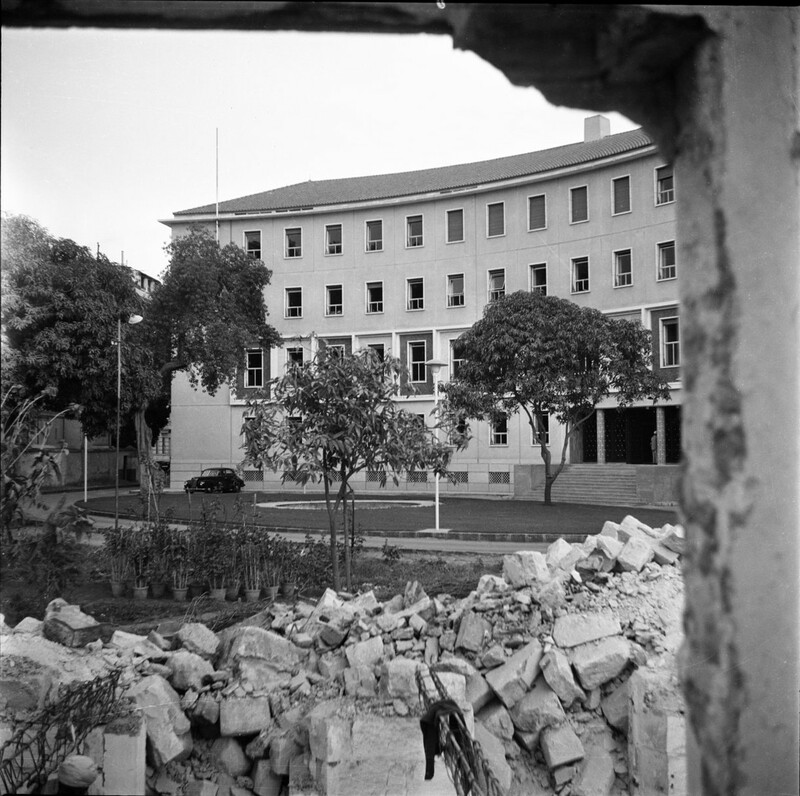 New offices, 1956, with demolition of Bacos building in foreground. PSA compound development proposal, 1978. OED proposal, designed by Seifert architects, for six-storey block of flats, 1986. Proposal for new visa office, with staff flats above, on site of ballroom, by Jeremy Dixon architect, 1989.